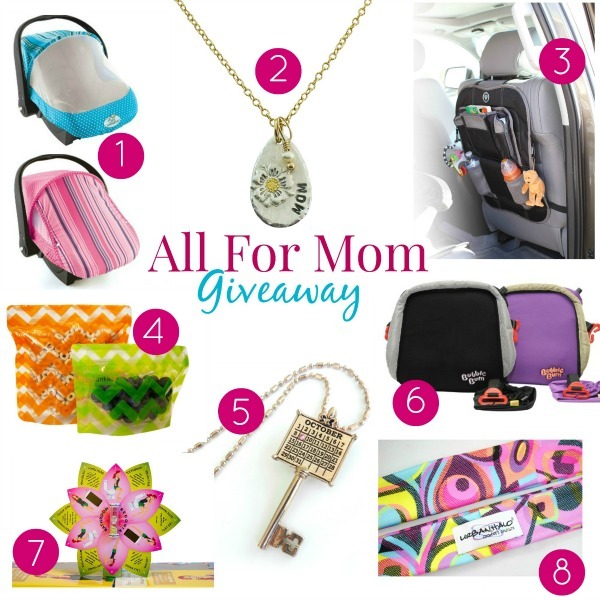 Welcome to the “All For Mom” Giveaway hosted by The Mama Experience! 1. Cozy Sun & Bug Cover from Cozy-Cover provides 98 percent protection from the sun’s harmful UV rays, while keeping baby safe from potentially harmful insects. The Sun & Bug Cover features a breathable, pull-over flap that provides additional protection from the elements such as rain and wind and creates a spacious, well-ventilated enclosure and allows baby to sleep when out and about. The Cozy Cover Infant Carrier Cover features a backless design, as recommended by car seat specialists, and does not interfere with child safety straps. It fits all car seats and is recommended for children from 0-12 months, the elasticized edge allows for easy use on an infant carrier. Additionally, the EVC Cozy Sun and Bug Cover has a compact design, for easy storage in a diaper bag or a stroller pouch. 2. The Bloom Necklace from Isabelle Grace Jewelry celebrates motherhood and what moms do for their children in and outside of the womb. Made of fine (.999) silver and 22 kt. gold, this piece features the words “Mom” on one side and “You Make Me Bloom” on the other, along with a freshwater pearl representing a seed that will grow. A perfect gift from baby or child to mom. 3. Prince Lionheart Back Seat Organizer– Keeping the family car neat and organized is a common struggle for most of us. In addition to helping us keep things straight, this Organizer has been thoughtfully designed by parents to maximize function and, believe it or not, restore sanity. For example, in case of car seat meltdown, top left and right pockets are designed for distraction toys, opaque to capitalize on the element of surprise, affording child a moment of intrigue and parents a moment of silence. Ah, sanity restored. Comes in black/gray or brown/gray. 4. BooginHead Pack’Ems are the perfect companion to your kids’ lunch and snacks. They come in both large and small and feature a gusseted bottom for easy, stand-up design. They are easy to open and close with unique VELCRO® brand Press-Lok™ patented material. The best part is they are made of extra durable, environmentally friendly plastic that holds up through multiple washes and keeps food fresh longer. They are dishwasher-safe, easy-to-clean, BPA, PVC and phthalate-free. Reusable, recyclable and affordable, what’s not to love! 5. Not Just Any Old Day offers datesake jewelry featuring the calendar key pendant so you can keep that special date close to your heart. Your special date holds a special swarovski crystal. Available in silver, rose gold and brass finish in key pendant or crown calendar charm designs. Also available as a ring or bracelet. Winner will receive a Calendar Key Necklace. 6. BubbleBum inflatable booster car seats are the coolest and most stylish way for kids to carpool to school! BubbleBum keeps kids safe and comfy on the way to school, and kids go gaga over the booster seat’s vibrant and trendy colors! The BubbleBum inflatable booster seat is a fantastic alternative to the standard plastic booster seat and is perfect for road trips, fly ins with car rentals, taxi cabs and every day carpooling. Weighing in at less than one pound, BubbleBum can deflate in minutes, making it simple to throw in a backpack or large purse. BubbleBum includes belt positioning clips in place of arm rests, so it’s possible to fit three boosters across the back seat of a car, minivan, or SUV. 7. The Bathroom Begonia from Fitness Flower is a series of six simple and effective exercises that fit seemlessly into your existing beauty routine. It’s an easy way to include a workout in any time-crunched day.When you purchase the Bathroom Begonia, you receive the flower, which explains the exercises, a sand hourglass to time each exercise and attach the flower to your bathroom mirror, and a brochure with a checklist you can use to get the most from your workout. As a bonus, we included the Reading Rose Bookmark, which has six extra exercises you can do without getting out of bed. 8. UrbanHalo is the fashionable and functional, no-slip headband for active women and moms! UrbanHalos which boast no slip, no headache, no sweat, come in a vast array of colorful patterns and designs and are made from a signature buttery soft fabric that are custom printed in the U.S from eco friendly water based inks. Stylish enough to take mom from spin class to preschool pickup, yet functional enough to stay in place without causing headaches. It’s like a hug for your head! So many great prizes!! All moms deserve the best tools to use! Enter to win a Mother’s Day Prize Package valued at $260! Giveaway ends May 2nd at 11:59pm and is open to US residents, ages 18+. Just enter below on the Rafflecopter form. Good luck! Disclosure: The participating bloggers were not compensated for this post and are not responsible for prize fulfillment. Please contact erin(at)themamaexperience.com with any questions or to have your product featured in a similar giveaway event.